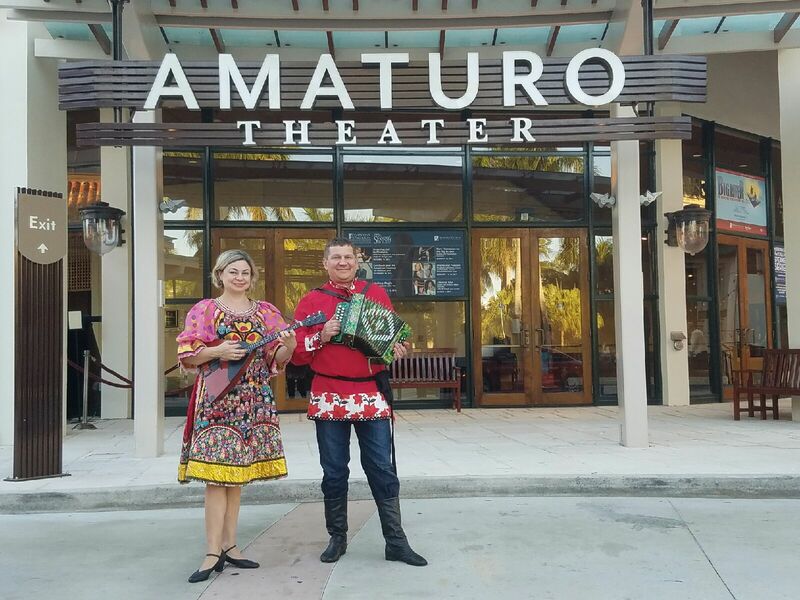 On Saturday, February 11th, 2017, 5:45pm to 7:15pm Russian music, dance and song Balalaika Duo (Elina Karokhina, Mikhail Smirnov) performed at the Fort Lauderdale Grand Russian Ball 2017 at the Mary Porter Riverview Ballroom, Broward Center for the Performing Arts, 201 Southwest 5th Ave, Fort Lauderdale FL 33312. 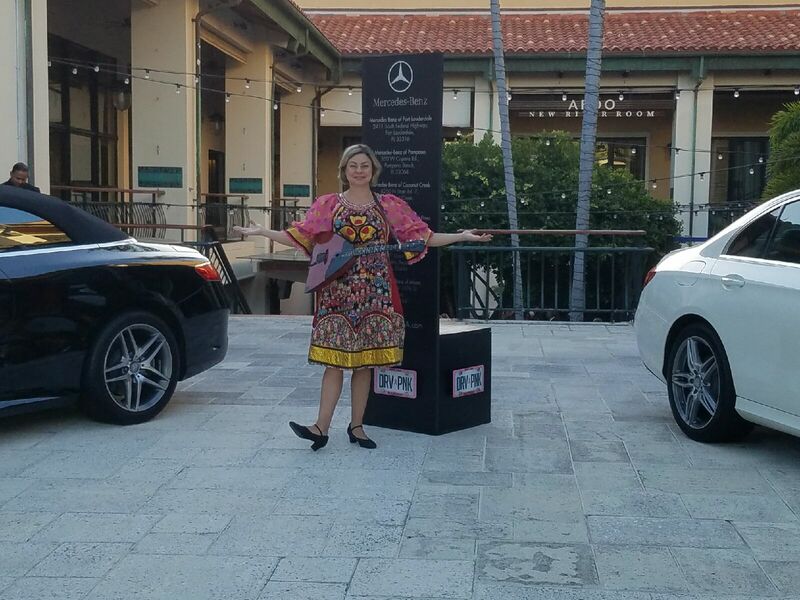 Black Tie Gala took place to mark the 75th Anniversary of Florida Grand Opera. In the tradition of Grand Opera, the Gala evening began with cocktails, hors d’oeuvres and an opulent dinner in the Mary N. Porter Riverview Ballroom. 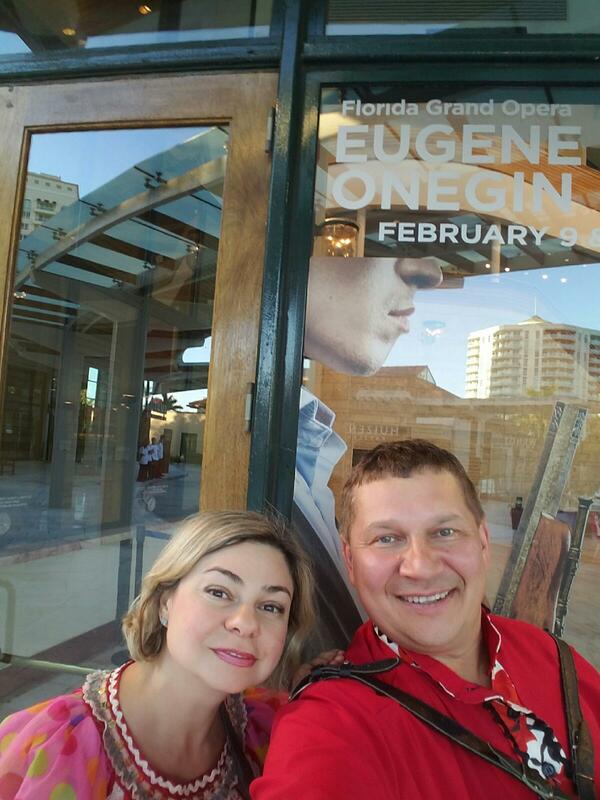 Following dinner, guests entered the Broward Center’s Au Rene Theater to enjoy Tchaikovsky’s most beloved opera – Eugene Onegin. 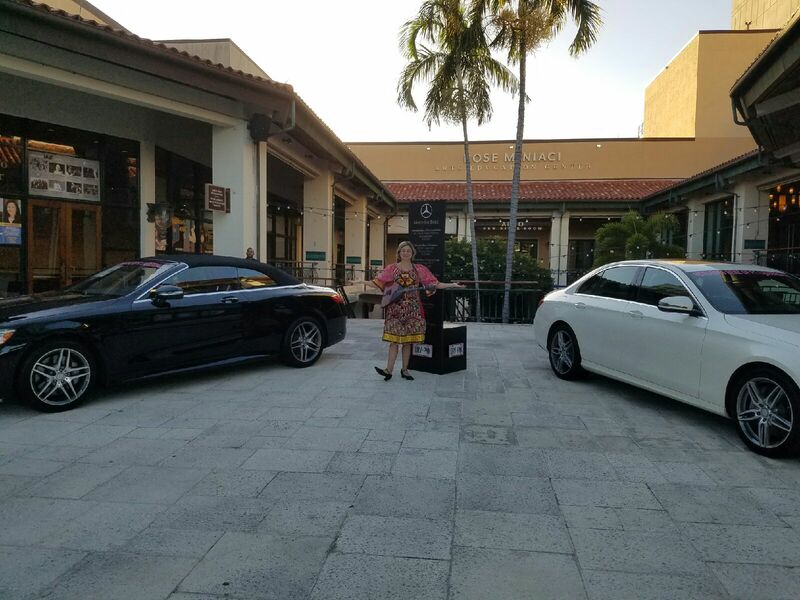 Following the performance, everyone returned to the Riverview Ballroom for dessert, dancing and greeting the international opera stars. 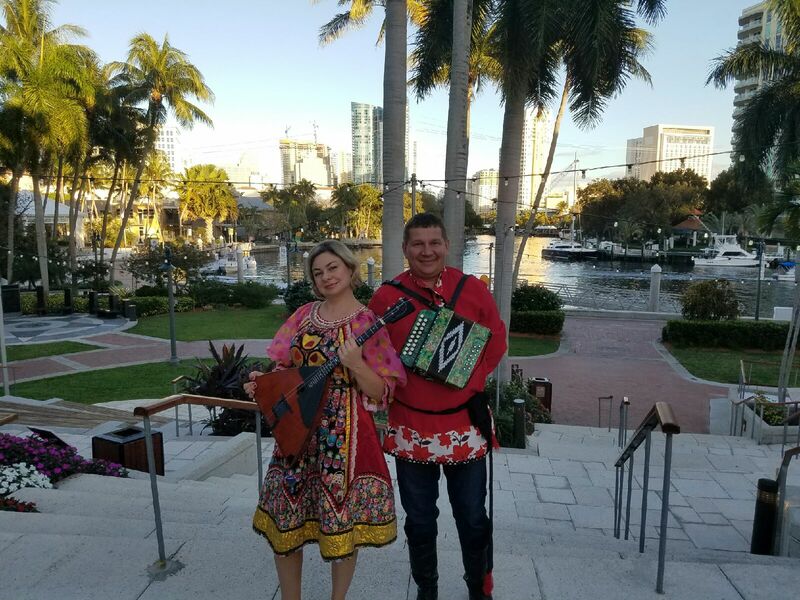 The program of Balalaika Duo's performance included Sabre Dance from "Gayane" by Aram Khachaturian, "Fiddler On The Roof" Medley, "Two guitars", Csardas by Vittorio Monti, Paganini's Caprice No. 24, "The Gypsy Trail" (Мохнатый шмель), Rondo Alla Turca (Turkish March) by Wolfgang Amadeus Mozart, "Dark Eyes", Polonaise No. 13 in A minor, "Pozegnanie Ojczyzny" (Farewell to the Fatherland) by Michal Oginski, "Those Were The Days", J.S. Bach - Suite No. 2 - Badinerie (Joke), Pidmanula (Ты ж мэнэ пiдманула), Waltz for Jazz Orchestra No. 2 by Dmitri Shostakovich, Светит месяц - The Moon Is Shining Brightly, Waltz "Babochka" by V. Andreev, Felt Boots (Валенки), Variations on a Theme of Corelli in the Style of Tartini. Composer, Kreisler, Fritz, Iced House ("Потолок ледяной, дверь скрипучая"), Dr. Zhivago's "Somewhere, My Love" (Lara's Theme), and other selections. Elina Karokhina was born in Leningrad (now Saint Petersburg), Russia. She began her formal training at the Mussorgsky Music College of St. Petersburg and continued her training at N.A. Rimsky-Korsakov Saint Petersburg State Conservatory, earning a degree as an Orchestra Soloist. Elina continued her training at the Conservatory, which included a brief residency in Germany. 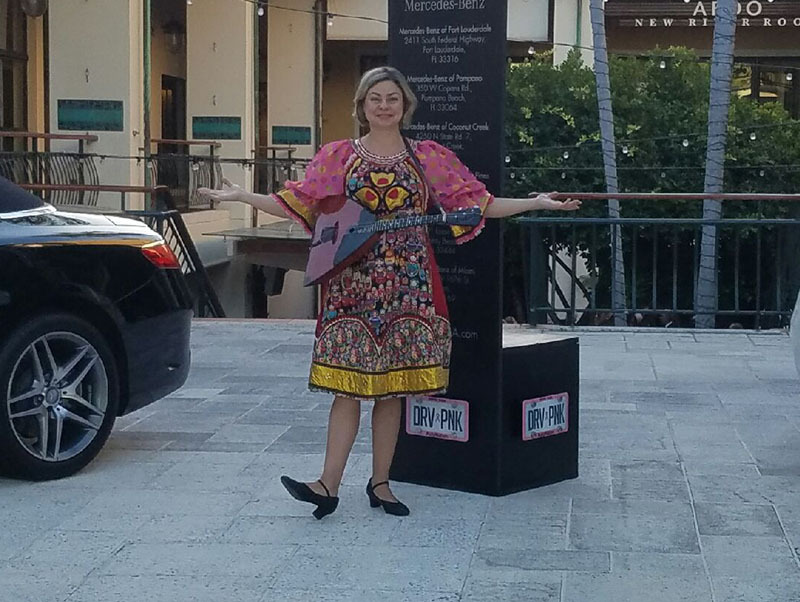 After, she returned to her native St. Petersburg and completed her education, earning a Doctor of Musical Art Degree in the Balalaika Teaching and Performing. Following the Graduation, Elina began working as a musician, both as a teacher and as a performer, teaching balalaika. Mrs. Karokhina served in the Russian Army in the Military Ensemble in the Northwest Order of Red Stars. She is a winner of International Music Competition in Cherepovets and a Holder of the First Place in Troyanovsky's Competition for musicians performing of traditional instruments in St. Petersburg, Russia. As a balalaika soloist Elina has toured all over the world. She was a soloist of State Concert Russian Orchestra of Saint Petersburg under direction of Honored Performer of Russia Vladimir Popov (Russian: Государственный Русский концертный оркестр Санкт-Петербурга, Художественный руководитель и главный дирижер – Заслуженный деятель искусств России ВЛАДИМИР ПОПОВ.) When she moved to the United States in 2009 she was hired as a musicial director and soloist with the biggest professional Russian music, song and dance ensemble Barynya (New York). In January 2015 Elina Karokhina was selected to perform the balalaika part with Mariinsky Theatre directed by world-famous conductor Valery Gergiev in Rodion Shchedrin's opera "The Enchanted Wanderer" at the Howard Gilman Opera House in Brooklyn, New York. In May 2016 she was hired to play several concerts at the Carnegie Hall in New York City with symphony orchestra, choir, and opera soloists as a soloist of "The Orchestra Rocks" production. In September 2016 he appeared at the Carnegie Hall again as a part of "Moscow Gypsy Army" representing rich musical culture of Eastern Europian Roma people. In January 2017 Elina was hired to play Nikolai Rimsky-Korsakov's "The Legend of the Invisible City of Kitezh" Suite at the Kennedy Center in Washington D.C. with the National Symphony Orchestra. All four performances were under direction of world-famous conductor Sir Mark Elder. In 2017 Elina was invited to perform as a Honored Guest Artist at the Balalaika and Domra Association of America 40th Jubilee Convention in Philadelphia (July 2018). Dancers, musicians, and singers of Barynya ensemble in Bloomingdale, Canada, Toronto, Canada, Winnipeg, Canada, Chino Valley, AZ, Dateland, AZ, Mayer, AZ, Oracle, AZ, Peoria, AZ, Phoenix, Arizona, October 2017, Phoenix, AZ, March 2013, Tucson, AZ, January 2017, Tucson, AZ, October 2017, Alameda, California (CA), Altadena, CA (2013), Altadena, CA (2017), Belmont, CA, Сamarillo, CA, Сeres, CA, Chatsworth, CA, Coalinga, CA, Corcoran, CA, Crescent City, CA, El Monte, CA, Farmersville, CA, Fresno, CA, Georgetown, CA, Hanford, CA, Happy Camp, CA, Hayward, CA, Hidden Valley Lake, CA, Hillsborough, CA, Kenwood, CA, Lincoln, CA, Lomarica, CA, Los Angeles, CA, Los Gatos, CA, Meadow Vista, CA, Mendota, CA, Moreno Valley, CA, Oceanside, CA, Oxnard, CA, Pasadena, CA, Placerville, CA, Port Hueneme, CA, Poway, CA, Rancho Palos Verdes, CA, Ripon, CA, Roseville, CA, Sacramento, CA, Salida, CA, San Jose, CA, San Leandro, CA, San Mateo, CA, Santa Ana, CA, Santa Barbara, CA, Santa Rosa, CA, Seiad Valley, CA, Spring Valley, CA, Sun Valley, CA, Sunnyvale, CA, Temecula, CA, Thousand Oaks, CA (2013), Thousand Oaks, CA (2017), Tracy, CA, Turlock, CA, Ukiah, CA, Walnut Creek, CA, West Hills, CA, Windsor, CA, Yreka, CA, Yuba City, CA Brighton, CO, Denver, CO, Colchester, CT, Darien, CT, Eastford, CT, Enfield, CT, Greenwich, CT, Greenwich, CT 2015, Middletown, CT, Norwich, CT, Plainfield, CT, Stamford, CT, Stratford, CT, Stratford, CT, Taftville, CT, Weston, CT, Wolcott, CT, Woodstock, CT, Washington, DC, Northwest Regional Library, Cape Coral, Florida, Cape Coral Lee County Public Library, Cape Coral, FL, Church of Scientology Flag Service Organization, Clearwater, FL (November 2015), Clearwater, FL (August 2015), Daytona Beach, FL. Wedding DJ, MC, Tamada Stetson University, DeLand, Florida, King's Point Delray, Delray Beach, FL, Jewish Heritage Club, Delray Beach, FL, South County Regional Library, Estero, FL, Mary Porter Riverview Ballroom, Fort Lauderdale, FL, Lakes Regional Library, Riverdale Branch Library, Fort Myers, FL, Florida Gateway College, Lake City, FL, Central Park Performing Arts Center, Largo, FL, East County Regional Library, Lehigh Acres, FL, Siberian Floors Miami, Miami, FL (Dec 2015), Siberian Floors, Miami, Florida (2013), Miami, FL (2010, 2011), Miami Dade College, Florida (2010), South Mainland Library, Micco, FL, Fort Myers Public Library, North Fort Myers, FL, Orlando Public Library, Orlando, FL, Panama City Beach, FL. Wedding DJ, MC, tamada Pine Island Public Library, Pine Island, FL, American Heritage School, Plantation, FL, Sarasota Opera House, Sarasota, FL, International Folk Fair Festival, St.Petersburg, FL, Kings Point In Tamarac Club HS, Tamarac, FL, Frances T. Bourne Jacaranda Public Library, Venice, FL, West Palm Beach, FL, West Palm Beach, FL. Birthdy party, dancers, DJ, MC, tamada Lahaina, HI, Lamoni, IA, Elk City, ID, Arlington Heights, IL, Batavia, IL, Medinah, IL, Oak Park, IL, Princeton, IL, Quincy, IL, Bloomington, IN, Brookville, IN, Columbus, IN, Evansville, IN, Laurel, IN, Lebanon, IN, Shelburn, IN, Shelbyville, IN, Colony, KS, Eureka, KS, Gardner, KS, Beechmont, KY, Jackson, KY, Lexington, KY, Morehead, KY, Pikeville, KY, Stanton, KY, Bastrop, LA, Tallulah, LA, Agawam, Massachusetts, Boston, MA 2015, Cambridge, MA, Cape Cod, MA, Chestnut Hill, MA, Gardner, MA (2013), Stoneham, MA, Topsfield, MA, Townsend, MA, Annapolis, MD, Arnold, MD, Baltimore, MD (2017), Baltimore, MD (2014), Wedding George Peabody Library, Baltimore, MD, Bel Air, MD, Easton, MD, Finksburg, MD, Joppa, MD, Largo, MD, Laurel, MD, Ridge, MD, Rockville, MD, Sandy Spring, MD, Silver Spring, MD (2017), Silver Spring, MD (2011), Tilghman, MD, Bowdoin College, Brunswick, Maine, Bristol, ME, Portland, ME, Detroit, MI, Holland, MI, Kalamazoo, MI, Petoskey, MI, Rockford, MI, Taylor, MI, Westland, MI, Florissant, MO, Gorin, MO, St. Louis, MO, Jefferson Memorial, St.Louis, MO, Canton, MS, Union, MS, Asheville, NC, Chapel Hill, NC, Kill Devil Hills, NC, Kitty Hawk, NC, Mocksville, NC, Fairbury, NE, Omaha, NE, Center Sandwich, NH, Wolfeboro, NH, Far Hills, NJ, Fort Lee Public library concert, Freehold, NJ, Gladstone, NJ, Mahwah, NJ, Monroe, NJ, Toms River, NJ, Farmington, NM, Fruitland, NM, Lovington, NM, Milan, NM, Henderson, NV, Wedding Las Vegas, NV, Las Vegas, NV, Albany, NY, Albion, NY, Amitvylle, NY, Avon, NY, Brooklyn, NY, Buffalo, NY, Geneseo, NY, Holbrook, NY, Jeffersonville, NY, Lake Ronkonkoma, NY, Nanuet, NY, New Rochelle, NY, Carnergie Hall, NYC, Plattsburg, NY, Purchase, NY, Queens, NY, Rego Park, NY, Rensselaer, NY, Riverhead, NY, Rochester, NY, Scotia, NY, Slate Hill, NY, Somers, NY, Southampton, NY, Happy Island Senior Center, Staten Island, NY, Staten Island, NY, Watertown, NY, Westhampton Beach, NY, Akron, OH (July 2015), Cincinnati, OH 2013, Cincinnati, OH 2016, Cleveland, OH, Likeside, OH, Warren, OH, The Dalles Middle School, The Dalles, Oregon, Deep Creek Damascus K8 School, Damascus, OR, Danebo Elementary School, Eugene, OR, Eugeine, OR, Slavic Festival, January 2006, Eugeine, OR, Slavic Festival, January 2007, Riley Creek School, Gold Beach, OR, Fairview Elementary School, Klamath Falls, OR, Columbus Elementary School, McMinnville, OR, Harrison Park Elementary School, Portland, OR, Richmond Japanese Immersion, Portland, OR, Riddle Elementary School, Riddle, OR, Jewell School, Seaside, OR, Delphian School, Sheridan, OR, Adams County Heritage Festival in Pennsylvania, Aston, PA, Doylestown, PA, Du Bois, PA, Dunmore, PA, Erie, PA (Troika Fest), Gettysburg, PA, Houtzdale, PA, Lake Como, PA, Lansdale, PA, Millerstown, PA, St. Marys, PA, Aguadilla, PR, Cayey, PR, San Juan, PR, Clayville, Rhode Island, Charleston, South Carolina, Florence, SC, Lancaster, SC, Latta, SC, Mt. Pleasant, SC, Memphis, TN, Amarillo, TX, Dallas, TX, Fort Worth, TX, Ira, TX, San Antonio, TX, Waco, TX, Arlington, VA, Big Island, VA, Earlysville, VA, Fairfax, VA, Harrisonburg, VA, Lynchburg, VA, McLean, VA, Radford, VA, Spotsylvania, VA, Crestwood Elementary School, Bonney Lake, WA, Chloe Clark Elementary School, Dupont, WA, Monroe Elementary School, Everett, Washington, Garfield Elementary School, Olympia, WA, North Omak Elementary School, Omak, WA, SSA Acoustics, Seattle, WA (2012), Pathfinder School, Seattle, WA 2013, Emerson Elementary School, Snohomish, WA, Wilkeson Elementary, Wilkeson, WA, Dodgeville, WI, Kenosha, WI, Livingston, WI, Morgantown, WV, Sand Fork, WV.